A crowd assembled on Saturday in Dublin, Ireland, outside the headquarters of RTE, the country national broadcaster to protest against ‘biased reporting,’ which they say only represents the interests of the elite. About 150-200 activists gathered at Sacred Heart Church in Donnybrook and then made their way to RTE HQ, under heavy police presence, Irish press reported. The rally participants acted in a “quite peaceful manner,” witnesses told the Irish Independent. Another march was held near Mountjoy Prison in Dublin where activists gathered to support the water protesters jailed in February. Five people are currently being held in prison after objecting to the Irish government’s decision to tax water. The water tax is a part of the Irish government's plan to repay billions of socialized bank debt, resulting from a banking crisis that brought Ireland's economy to its knees. Following an IMF/EU bailout in 2010 that ushered in harsh austerity measures, the country’s economy is yet to fully recover. 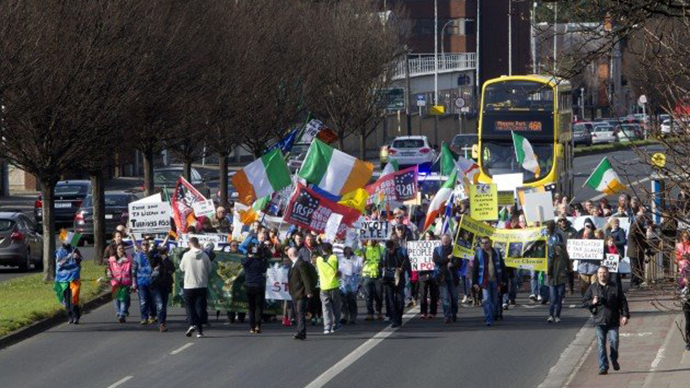 Saturday’s demo was organized by anti-austerity and political campaign groups from regions across Ireland. Among these are anti-water charges campaign organizations that have protested regularly in recent months against the government’s water taxation policy shift. The campaigners accuse the station of portraying Ireland as a nation in recovery, when in reality unemployment remains stubbornly high, suicide rates are soaring, and families who have bailed out corrupt bankers are being evicted from their homes and forced onto the street. “Minor acts of civil disobedience such as picketing have been framed as violent acts,” he told RT. The demonstration on Saturday is one of many recent protests in Ireland, as citizens continue to battle against austerity and economic stagnation.